Available in extremely limited numbers, only from Guitar Center, the Chapman ML3 Pro Traditional is the UK guitar-maker's first venture into semi-hollowbody guitars. With a stunning honey-burst finish and custom P-90 pickups, this is a guitar that is destined to become a legend. Chapman's crowd-sourced design process is behind this new guitar. Founder Rob Chapman found that everywhere he went, players wanted to know when he was going to make a semi-hollow instrument. After using Chapman's web-based voting process, the feature set, color and electronics were chosen by enthusiastic guitarists, longing to see the result. Based on Chapman's ML3 Pro set-neck body style the Traditional model carries the same graceful lines, with a smooth "tummy cut" in the mahogany body and a gorgeously arched top. The honey-burst finish on a maple top was an overwhelming voter choice for this guitar and Chapman Guitars, already known for their finishes, was glad to comply. Aesthetically the cream pickup covers and binding make this guitar instantly fit into a classic, vintage vibe. 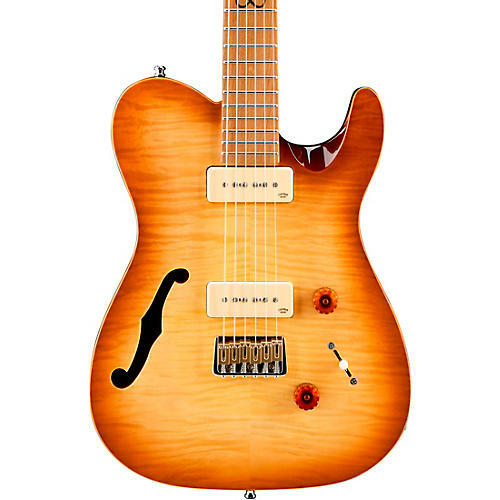 The 22-fret roasted maple neck and fingerboard feature Chapman's smooth, fast profile and rolled edge binding, for a seamless playing experience. The signature Chapman "Infinity" inlay at the 12th fret brings an extra touch of class, and the "spoon-cut" neck joint eases upper-fret access. For modern convenience, the side dot markers glow in the dark to guide you in tricky stage lighting. Loaded with custom-wound Chapman P-90-style wide-bobbin, single-coil pickups, the ML3 can easily go from a whisper to a scream, all with a harmonic richness and singing tone that will satisfy your soul. Plus, expect great tuning stability from the Hipshot GripLock tuners and solid, 6-saddle, thru-body-strung, hardtail bridge. This limited-edition model comes with a nice Chapman hardshell case.